ns2.siteground125.com, and ns1.siteground125.com are its DNS Nameservers. It is hosted by Cloudflare Inc. California, using cloudflare-nginx web server. 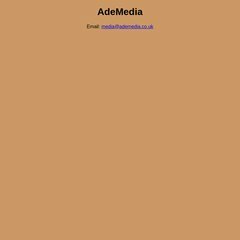 Ademedia.co.uk's IP address is 108.162.194.84. PING cf-protected-www..cdn.cloudflare.net (108.162.194.184) 56(84) bytes of data. Pinging the server, resulted in a 12.0 ms response.